Brian was heading up to Hawera today to visit someone and I had a new screen to test out so that was more than enough of an excuse to tag along and then go and visit my sister. It was a little chilly when we left but a very calm and sunny winter's day so it was a great day for just pootling and enjoying the scenery - the mountain was free from cloud and looked magnificent. North of Hawera I left Brian as I continued northwards to Christine's. It was very nice there too, looking out on a fantastic view while feeding my face and playing with my little nephew, Billy the kid. I left Christine's at about half two and started making my way home. I'd noticed in the morning that the bike was running very economically so I decided to see if I could maintain the good economy and see how far I could get on the tank. Initially I thought that Wanganui would be pushing things but in the end the fuel light only just came on as I got to the outskirts of town (still 4L to go). I ended up with an awesome figure of 5.34L/100km for that tank. Fuelled up again I crossed Wanganui and decided that it was time to get off the boring main road. 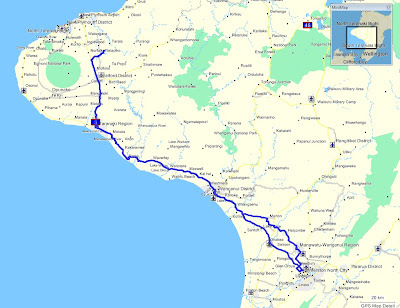 I ended up turning onto Wanganui Road at Turikina and going home via Marton, Halcombe and Fielding again. A bit chilly by the time I got home but a fantastic day out on the Connie. Well not quite but it's a little higher and wider than the stock screen - I finally got my new Projekt D screen out of customs and onto the bike. I think the smoke colour looks very nice and that the screen looks fine whether up or down. On a 400 odd km ride today I tried it in various positions and found that there is still noise generated by the screen but perhaps not quite as loud as the stock when in it's highest position. At the start of the ride this morning it was around 6 degrees and I could only real feel the cool air hitting me on my upper arms and shoulders. Nothing hitting me in the neck and overall I'd have to say that there is a definite improvement in weather protection - which of course is what I expected. It will be interesting to see how it performs in wet weather. Yep, a pretty blustery day today and after a late start due to much discussion about the weather, six of us took to Pohangina Valley East Road and did the Apiti Loop. While in the valley we managed to mostly keep out of the wind but had to play it pretty careful as the winter weather normally causes a bit of havoc on Pohangina Valley East Road with the possibility of slips, branches, stock and all manner of rubbish on the road. Today it was not too bad but there were a few places where there had been slips or a farmer's tractor had spread mud around - just enough to spice things up and keep ya on ya toes. We stopped in Kimbolton where we tucked into hot drinks and food before tackling the wind again on the big straights from Kimbolton into Fielding. Nice to get in a decent little pootle before going back to work tomorrow. A while ago I installed two Narvra +50% bulbs in the Connie hoping to turn night into day. While they were an improvement on the standard bulbs I have had 2 blow in a very short time so they appear to be a little fragile. I've just finished installing a rear hugger from Projekt D onto the Connie. It wasn't that cheap although I managed to save a little by conning Meanie & Brian into getting one too and also getting a couple of screens which are still with customs (I won't mention the hassle I'm going through there). The hugger went on pretty easily although I did remove the muffler (more on that later) to make things easier to get at. I think that it looks great and hopefully it'll keep a lot of crap off the shocky and other bits of the undercarriage. Not a very flash day weather wise today but the Fielding Riders had planned an excursion to take in Fields track so Mark, Brian, Dave and I were keen. The only thing was the weather had put off everybody else - so we had to go by ourselves. Over Vinegar Hill we were in light rain most of the way and then once on SH1 it dried up a bit for a while until about Taihape where things got quite wet and the temperature started to drop. By the time we hit Waioru the temperature was do wn to 2 degrees and it was time to grab some hot lunch before pressing on. Fields Track can be a bit dodgy at times and the first 20km or so was quite wet and slippery with dirt across the road in places. But once we got further into it the road surface got better (has obviously been some resealing done at some stage) and the weather also started to improve. As we dropped down the hill towards SH4 the road started drying out so the pace came a bit and the Para Para's were a blast. Just one more quick stop in Wanganui so the Suzy's could top up their tanks and we headed home taking in Turakina, Marton, Halcombe and Fielding. Mark & Dave peeled off at Fielding while Brian and I enjoyed one last shower of rain just before Palmy. Okay, so it's winter and it was cold & dark but it was a Friday and 2 Honda's needed some exercise so after work Brian and I raced home to gear up for a ride to Hunterville and back. Naturally we went out via Vinegar Hill and although there was quite a bit of traffic we still had a bit of fun on the hill and through some of the windier bits. We obviously took it a bit carefully in deference to the time of day and the possibility of damp corners in places. After a bite to eat in Hunterville we pootled back down SH1 but turned of to go home via Halcombe and Fielding. One quick stop in Fielding for gas and then back home before it got too cold and frosty. Slightly mad but a nice little ride to wind down for the weekend. It's not often that it's a good thing when the weather forecast is wrong but it was nice to be greeted by a sunny day today rather than the forecasted wild and wet conditions. So, after a few chores and puttering around town I suited up for a wee pootle. 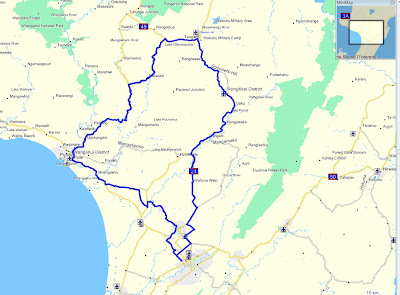 I decided on just a short ride over the track through to Mangamaire, Pahiatua, Ballance and then the Saddle Road home. 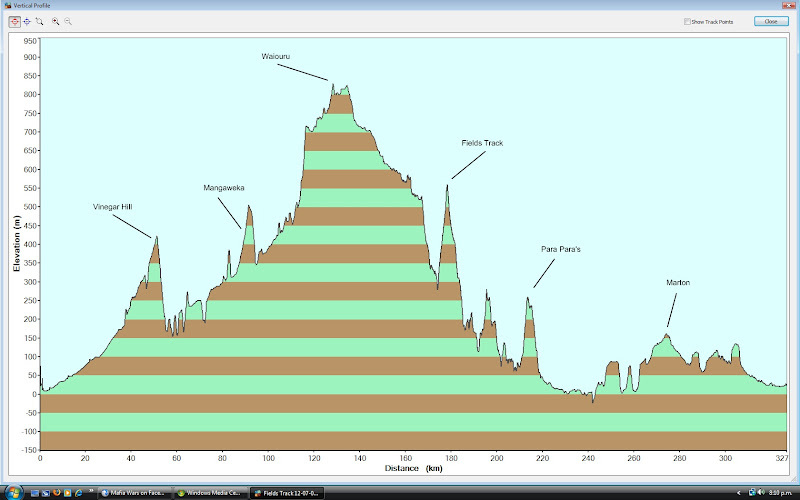 All up only about 100km but a great opportunity to give the Honda a little run and enjoy some corners. I took it pretty quietly as there were plenty of damp and slippery places but for the most part the roads were in good nick for this time of the year and there was plenty of fun to be had. 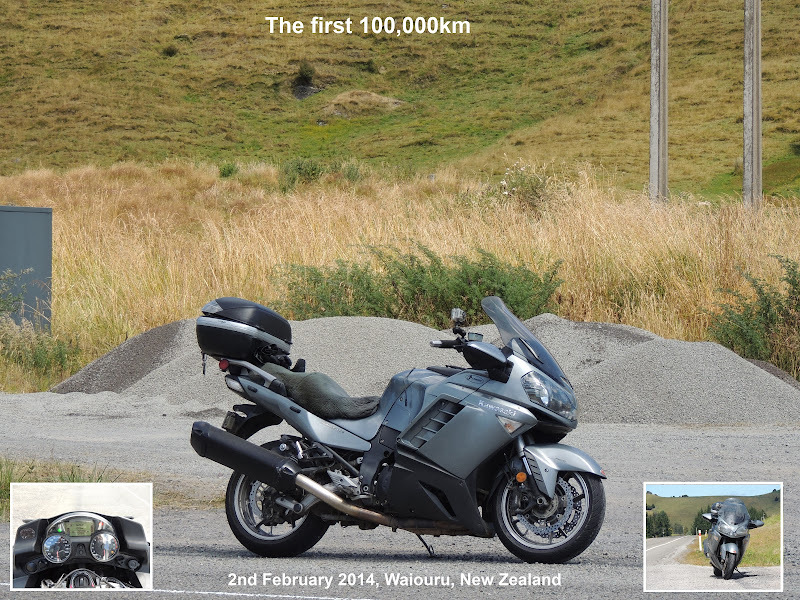 It was also great to see so many bikes out and about doing as I was - enjoying a nice winter's day out on the road. The only "interesting" moment I had was on the Ballance bridge (one-way) was an idiot in a car deciding to come onto the bridge while I was on it. Luckily he finally decided to open his eyes and backed off the bridge. Other than that a great way to enjoy a little sunshine!